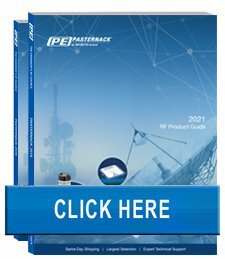 Pasternack Enterprises has more than 40'000 different RF components in stock - especially those special, hard-to-find coaxial connectors and adapters and the largest selection of off-the-shelf coaxial amplfiers. For a printed catalog please send us an E-mail. or view the interactive catalogue here. It enables you to configure your cable assembly with a vast range of coaxial and optical connectors and cables and individual length.